Does Your Lake Have Sediment Problems? Save Significant Money on Dredging Projects with The Mapping Network! The Mapping Network recently completed a mapping project for a large-scale home owners association in Arkansas. The large lake had 21 coves and several homeowners were having difficulties accessing their dock due to sedimentation. Here were some of the questions the HOA management team had:- where is the highest sedimentation occurring? – how much fluffy sediment (in cubic yards) is in each cove? – if the lake is drawn down 5 ft, what would the shoreline look like? – how much water (gallons and acre-ft) is in the lake? – if we make each cove a minimum of 4 feet deep for boat access how much material do we need to remove? – by undertaking this mapping process will it save us money in the end? The overall goal of the lake mapping project was to survey each cove for future dredging along with the creation of an accurate map of the entire lake. The lake had 21 coves and The Mapping Network collected water depths over the entire lake and fluffy sediment levels for all areas under 10 feet of water. 3D models were generated to show how much sediment had accumulated in each cove. Contour maps were also made for each cove and given to the lake manager and engineer to review for dredging planning. The Mapping Network then created cut-fill calculations and maps based on the specifications of the lake manager. The HOA then used this information as part of the bid package given to dredging companies. Presenting the precise plans took out the guess work and kept all the dredging contractors on task and it is projected to save the HOA an estimated $5,000-$12,000 per cove! An incredible cost savings when compiled over 21 coves. In the example maps below, The Mapping Network located the areas where the current depth was less than four feet, which was the dredging zone. 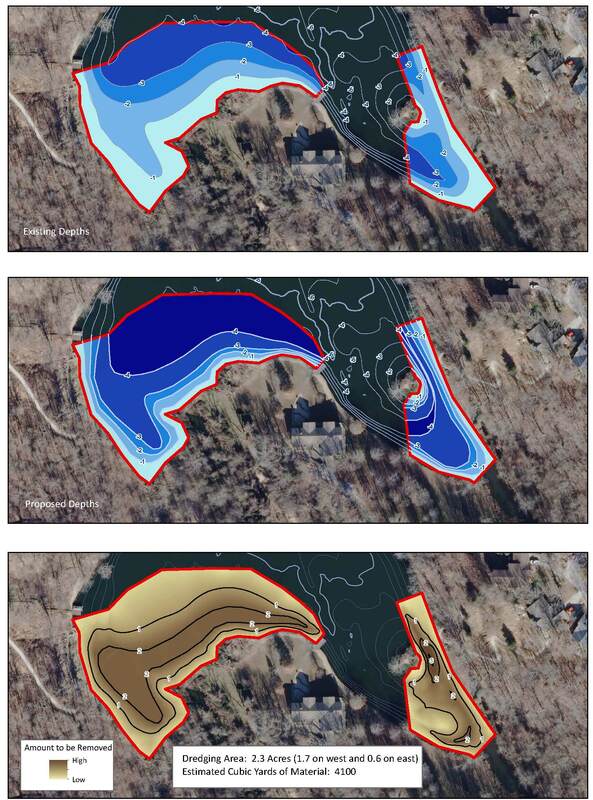 The mapping techniques utilized in this project helped the HOA accurately calculate and isolate areas of high sedimentation for removal and helped the property manager budget accordingly. A series of maps showing the selected area for dredging. are shown in blue shading. A cut-fill model (bottom) shows areas of cut needed to reach the goal. This entry was posted in Lake Map, News and tagged arkansas lake map, Bathymetric Map, Bathymetry, dredging a lake, dredging a pond, dreging, Fishing, GPS, GPS Lake, GPS Map, lake, lake dredge, Lake Management, Lake Map, Lake Mapping, lake sediment, Lake Survey, Sediment, sediment map, sediment problems, sediment removal, Sedimentation, Survey, The Mapping Network on August 3, 2011 by Moderator.